San Marco by Design continues to advance preservation and enhancement of the economic and social value, health and charm of the San Marco neighborhoods. 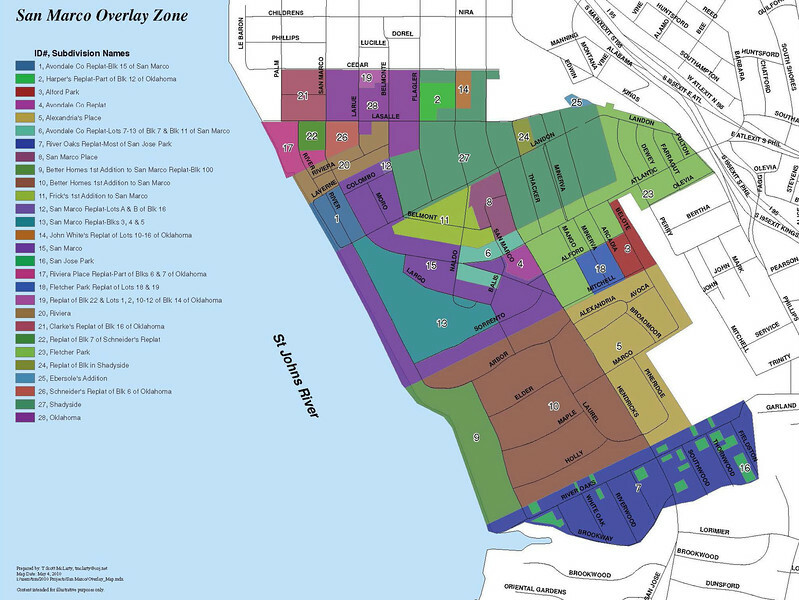 A planning effort that began in 2008 culminated with the first iteration of San Marco by Design: A Smart Growth Plan for North San Marco. The plan did not sit on a shelf for long. It has transitioned to the next logical step in the planning process, an implementation strategy that will guide future development. San Marco continues to be impacted by the construction of the Overland Bridge project. However; it has not had the severe negative effect on existing adjacent businesses as was anticipated. For example, Tidbits Restaurant continues to thrive amongst the dust. The timing of the San Marco legislation may be fitting because after years of static growth, there is a renewed interest in San Marco as indicated by a number of recently completed development projects. These recent projects together with a number of planned projects will provide a catalyst for growth and a synergy that could result in San Marco becoming Jacksonville’s fastest growing neighborhood. A vacant lot behind Tidbits Restaurant owned by San Marco Professional Building LLC is slated for a five-story, 50-unit apartment on the property. It is currently in the design phase. In addition, plans to redevelop the Florida Baptist Convention property located south of I-95 on Hendricks Avenue and Nira Street into a mixed-used residential building with retail space and on-site parking are being contemplated.